Reimagine Azamara: Our Cruise Ships Got A Makeover! Whether It's Your First Cruise With Us Or Your Fifth, You’ll Love Our Revitalized Boutique Hotel Experience. With guest satisfaction feedback consistently averaging at nearly 100% and countless industry and peer recognitions from around the world, Azamara sets the bar for delivering a destination-immersive experience to all of our guests who #LoveTravel. Now, we’ve made sure our two award-winning ships raise the bar even further. Earth – A muted color palette of earth tones is incorporated throughout our ships to evoke a serene, elegant, and warm sense of home. 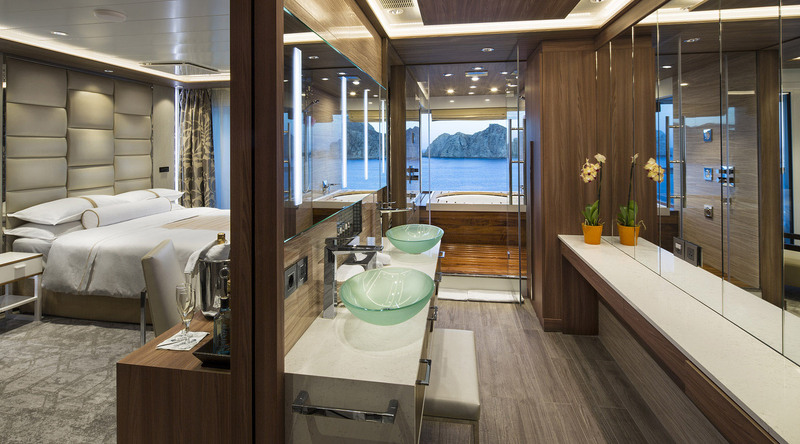 Water – Azamara’s new spa suites features rain showers with ocean views, double vanities, and outdoor soaking tubs overlooking the sea. Air – To freshly entice the senses, we’ve introduced new open-air venues and experiences. Fire – Sunrises and sunsets can be relished at the new outdoor Pool Grill & Bar, followed by dazzling nights in our completely revitalized entertainment areas. In addition, we integrated a tasteful blend of contemporary and classic designs to create new venues and public spaces, implemented new technologies, and upgraded every stateroom and suite, in addition to our restaurants and new holistic Sanctum Spa. From bow to stern, there is no area that has been untouched. And from shore to ship, we think you’ll #LoveTravel with the newly reimagined Azamara Club Cruises®. Contemporary yet classic, stylish yet refined, our completely transformed staterooms and suites are a feast for the senses. They incorporate the use of rich woods, custom-made textiles, organically inspired accents, and a natural color scheme with silver accents to create a fresh and elegant feel. Balance the physical, emotional, intellectual, and spiritual aspects of your life in one peaceful retreat. Introducing The Sanctum Spa; completely refreshed in a soothing and contemporary style, and even offering a private outdoor deck for select spa services. Bliss never felt—or looked—so good. Tempt the Tastebuds & Tantalize the Senses. Your senses will be deliciously enticed with our extensive enhancements. And in keeping with our Destination Immersion® concept, there are new worlds of flavors and experiences to enjoy, be they at the Patio, a wine and tapas bar or on the Living Room dance floor. You may never want to leave the ship. We reimagined the digital experience for guests, too! The Lobby now features huge display screens, interactive content, and destination highlights to inspire you for your next voyage, while full-signal strength WiFi provides Internet access ship-wide. Plus, our new in-room interactive TV experience includes entertainment on demand and live TV feeds, as well as cruise, itinerary, and port information.